Coastal flooding - the results of the policy of 'managed retreat'. I can just remember the aftermath of the 1953 floods. Although only five years of age at that time I can recollect seeing boats where they definitely shouldn’t have been – in fields! 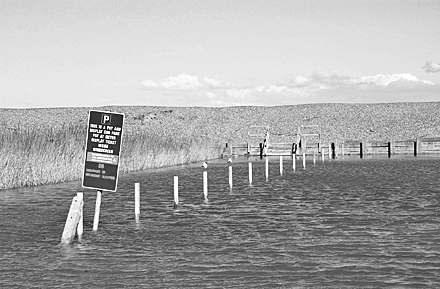 I was also on the coast at Cley and Salthouse in an official capacity during the inundation in 1979. Pantiles were crashing down onto the street and the water was within a few inches of the top of the sea wall at the end of Beau Rivage in Cley; the noise of the gale was such that you had to shout at each other to be heard and the heavy rain was horizontal, soaking through clothing in minutes. A clinker built boat that had been left on Cley beach was smashed to pieces. If you have witnessed the North Sea in a state of fury, being hurled against the land by a north-westerly gale, you will be well aware of the potential damage and danger of a repeat occurrence – which will certainly happen at some time. Bearing that in mind, imagine my surprise when it became apparent that the shingle bank sea defence at Salthouse and Cley was no longer to be maintained. I queried this policy with a Defra (then D of E) official who was working at Cley beach. He was fully confident that the new cut – then being constructed to take the Glaven across the marsh – would reduce the flood risk. His opinion was that any future inundation would be reduced as a result of this engineering work. He saw little cause for concern and was a a great fan of managed retreat. Naturally enough the local residents were not happy and a campaign of sorts was started but it was unsuccessful. The change in the flood warning system introduced in 2009 also raised concerns and this was highlighted in the national press. What of the future for the villages of Cley and Salthouse, the Cley NNT reserve and Salthouse marshes? At some point in the future the combination of a north-westerly gale and a tidal surge will once again assault our coast. With no protective shingle bank in place to mitigate the incursion the immediate result will be that the marshes will become the seabed until the North Sea eventually retreats. It is a strange and somewhat eerie feeling to stand on Salthouse village green with the waves lapping just a few feet in front of you. Where the marsh and grazing meadows used to be there is nothing green visible at all – just the grey North Sea. The coast road will be closed at Salthouse as it will be under several feet of water. If the flood is very severe the properties along the edge of the coast road will be inundated. Hopefully the warning will be sufficient and the local flood plan will swing into action, allowing prompt evacuation and the reduction of risk to human life. 1953, 1979, ???? When will it happen again – who can say? How will climate change impact our coast? For more information visit the Environment Agency website. The North Norfolk District Council also has responsibilities regarding coastal flooding. Also see an alarming Telegraph piece.